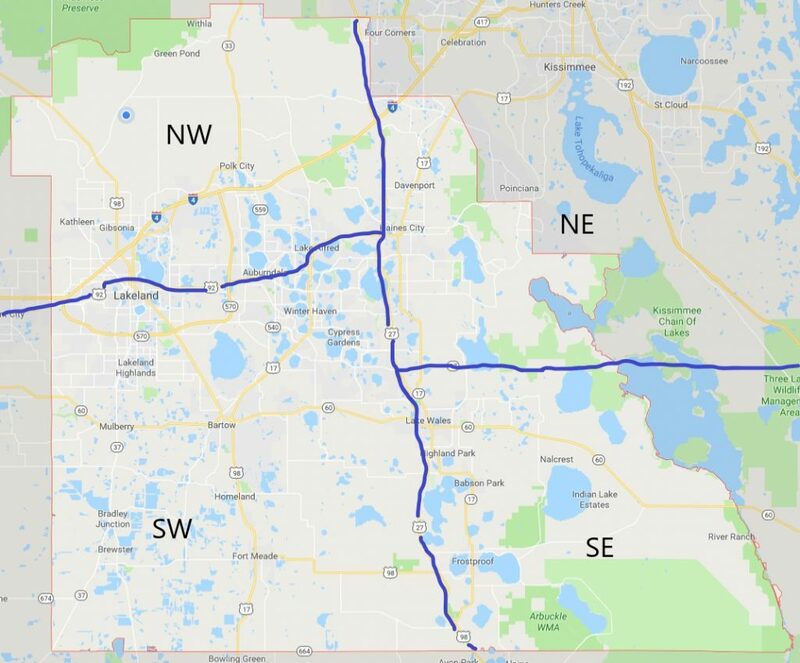 Polk County is roughly 2,000 sq. miles in size, and is covered quite adequately by the 4 WC4PEM repeaters. Because Murphy is alive and well, we can’t rely on the availability of those repeaters during significant events. All the above are Simplex, no tone. 2. When the primary Net Controller gives the instruction to do so, go to the Simplex frequency assigned to your region of the county. The Simplex net Control operator will indicate whether to use the VHF or UHF frequencies for the test. 3. Check the frequency for use. a. If not in use, give your call sign. Once another station has come back to you, decide which of you will be the region Net Control. – if they will not, do not push the issue and return to the WC4PEM repeaters and await instructions. c. If another station that is participating in the test has assumed region Net Control, then proceed as a check-in and give them your call sign. a. This is (your call sign), ARES Net Control for Region (your region) Polk County. Please check in to the net, one at a time. If you hear a station that is attempting to check in that I have not acknowledged, please relay that station’s call sign. b. Give the region net check in process approximately 10 minutes. 5. At the end of the region net check in, the region Net Controller should go to the county wide Simplex frequency and attempt to contact the County Net Controller. and wait for the Net Control to return from the Simplex..
b. If unable to contact the County Simplex Net Control, go to the WC4PEM repeaters to await further instructions. REMEMBER! These Simplex nets are extensions of the official Polk ARES nets! Please follow proper protocol in both the regional and county wide portion of the net. That is it. Pretty simple and should not take us more than around 30 minutes. Might want to print these out to make it a little easier. Your region – remember, this is a guideline – if you don’t hear someone in your region, go to one of the neighboring ones. Try to connect with the Countywide channel to let the NCO know that you did not hear anyone from your specific region. Squelch. Since we spend most of our time on repeaters, we sort of forget that we have that handy squelch control. In the Simplex world, make sure you are adjusting the squelch so that you can get into the clutter to try and pick someone out. Protocol. Don’t just jump in and talk over anyone. Treat this the same as our weekly nets. Once a net control has been identified, use the proper procedure to contact them. Alphabet. Use the proper phonetics. It is going to be tough to pick folks out so make sure you are using the proper phonetics to give your callsign. Antenna. It would be great of the little stubby antennas that came on our HT would perform as advertised, but in reality you need to setup a mag mount, j-pole or some other form of antenna that would get you out over all of the oak trees we have. Relay, relay, relay! Please pass on to the regional net controller if you hear someone and they don’t! These will be updated as we get more feedback.